Lion Festival slot was lucky fit its name into the online slots catalogue in the first place as we already have the games Lion Dance Festival from Genesis and Lion Dance by Red Tiger. Anyway, having managed to find a spare slot for the title (no pun etc.) Blueprint Gaming have imitated the Oriental theme centred around this Chinese tradition by placing the reels over a temple and I don't need to tell you the type of music you hear as the game plays. We simply need to know whether these Lions will produce a festival of fortune, or one of famine? The first point to note is that like many Blueprint games this is a 'Jackpot Strike' slot and is linked to a casino progressive. Randomly you may see Crowns overlaying the reels on any spin, from which you pick to either get more spins to collect further Crowns (15 gets you to the Jackpot Wheel) or instant Jackpot Wheel and lastly stop and get a cash award. The Wheel either gives the progressive or a large x stake multiplier. There are 5 reels of 3 rows each and we have 10 paying lines, working both ways from right-to-left as well as left-to-right. The icons fit the theme well as one would expect and are all stacked. 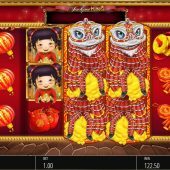 The pays range from 100x bet for a 5-of-a-kind Girl, 10x for the Chinese Character, 8x for both the Tokens and Bowl, 5x for the Lantern or Drum and finally 2.5x stake for the Pouch or Firecrackers. There are stacked Kittens which will all reveal a mystery symbol when appearing which may or may not create or improve a win. There are expanding Dragons on the centre 3 reels and these form the Wild. You can tell when one or more is going to land as the reels spin slightly longer. When this occurs any wins are paid and the expanded Wild then remains for a re-spin. Wins are paid again and the process repeats until no futher Dragons appear. This is essentially the same as a game I'm sure you're all familiar with, Netent's Starburst. Both in this feature and the base game you can fill the reels with the top Girl icon to win the maximum pay, 1000x bet.